Written by sylvia borgo on Thursday, October 8th, 2015 at 8:00am. All the elements were in place: a sold-out show, a top 10 album, a super blood moon. Duran Duran were poised to thrill — and thrill they did. The band opened the show with the title track from their 14th studio album, Paper Gods. To help out with backing vocals, English singer/producer Mr. Hudson joined Duran Duran onstage. That night, I realized that I could sing along and also concentrate on taking photos from the pit. 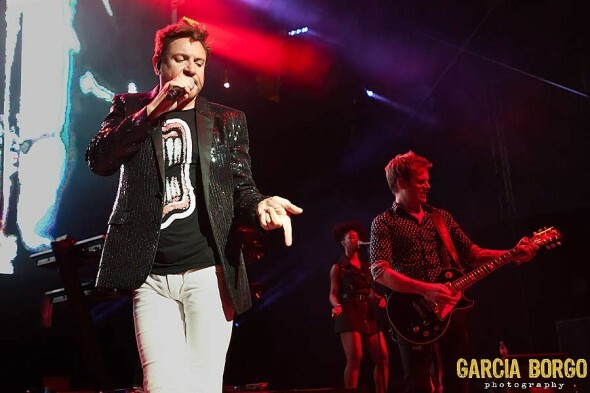 Knowing that the fans would be ecstatic with a few old hits, Duran Duran followed with “Hungry Like The Wolf,” “A View To A Kill,” and “The Reflex.” Each ’80s and ’90s Duran hit was met with ear splitting screams and enthusiastic dancing. Love Duran Duran…great photos! Wish I could’ve been there.